We went to the park for our annual mother’s group Halloween Party. It was a little chilly at about 46 degrees. 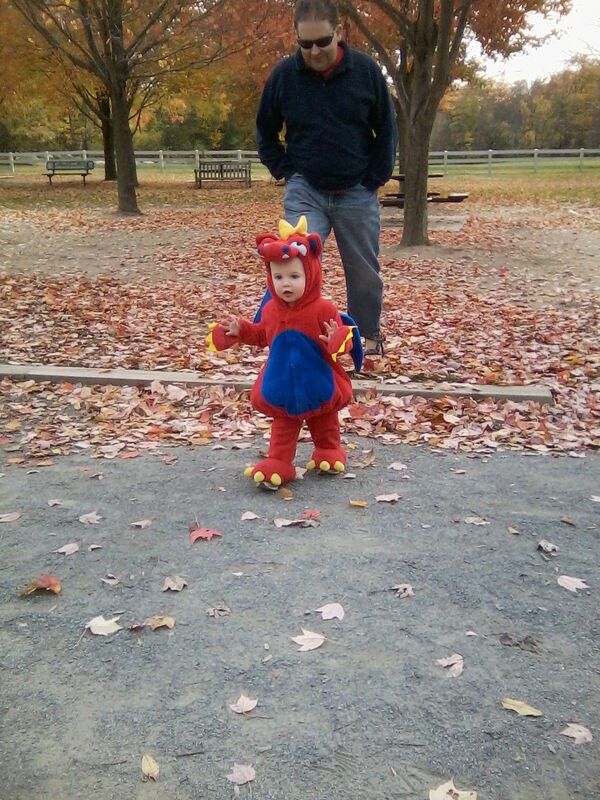 BURRRR Our little guy was warm and toasty in his Dragon costume. We spent most of the time running around after him and trying to keep him out of the “big” kid play area, which was clearly posted “ages 5 and over”. He wanted nothing to do with the toddler play area. I tried to snap a bunch of pictures and he was so fast that 95% of them are him looking away or running past me. I was able to catch this shot by sheer luck when I was walking up to them from putting our bag down. We had a blast and can’t wait to have him running around in his little Dragon costume for Halloween Trick or Treat and our towns annual party at City Hall.